Robert Louis Stevenson is best known for his beloved adventure novel Treasure Island, but he also penned one of my favorite quotes, “Wine is bottled poetry.” As an author, he likely did not bottle much wine, however, and the task itself is not that poetic. It is, however, the task that gets our wine into your hands, so off to the bottling line we go! Here at River Bend, we fire up the bottling line approximately fifteen times a year starting in the spring. Reds that have aged for the past twelve to twenty-four months are ready, as are the wines from last year’s harvest that do not benefit from extended aging. Set-up of the system falls into Al’s hands, and on bottling day he is in the winery by 6:30 a.m. 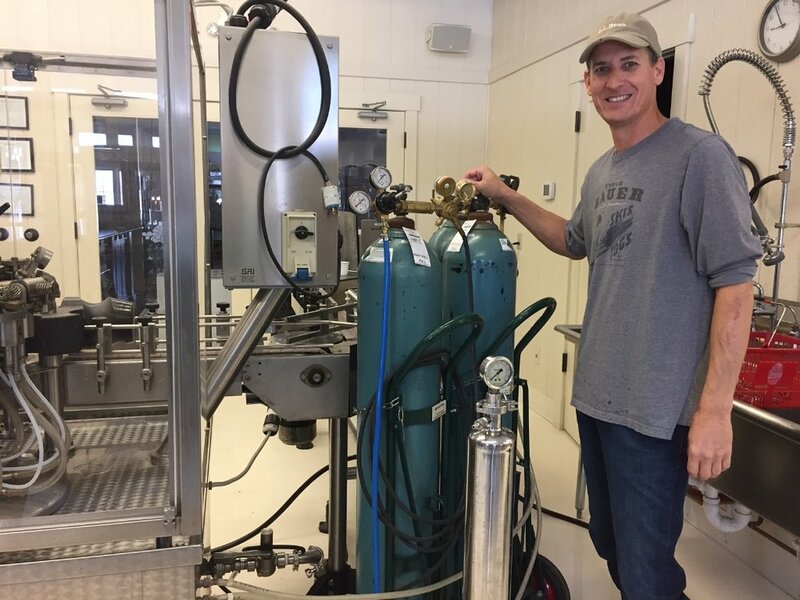 It takes four hours to completely prep the system, which involves attaching inert gas cylinders and final filters, cleaning and sanitizing the pump and bottler, and testing each stage of the line, of which there are several. Now we are ready to begin! After being loaded on a conveyor, each empty wine bottle is inverted and blown out with nitrogen. After being turned back upright, each bottle is purged a second time to displace any air (the enemy of wine). After the nitrogen purge, the bottle advances to the filling carousel. After filling, each bottle passes under the leveler, which ensures every one is filled to exactly the same height. From here, the bottle is vacuumed and corked and makes its way to the finish carousel from where it is loaded into a case. Sixty cases are loaded onto a pallet and are sent off to the warehouse to await labeling. With three staff members working the line, we can bottle approximately 250 gallons per hour. Once we are done, the whole system is cleaned again. Ten hours later (half of which were spent prepping or cleaning), we have approximately 5,000 bottles of finished wine. Whew…now it’s time to relax with one! So now that we have some wine in the bottle, it’s time to make spirits. Next week we’ll be checking in with Al in the distillery as he cooks up a batch of Bourbon whiskey. If you are a Bourbon fan, you won’t want to miss it.